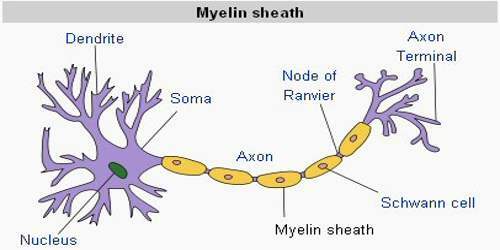 Myelin is a whitish, fatty substance that forms a sheath around many vertebrate nerve fibers. Myelin insulates the nerves and permits the rapid transmission of nerve impulses. The white matter of the brain is composed of nerve fibers covered in myelin. It is essential for the proper functioning of the nervous system. It is an outgrowth of a type of glial cell. In humans, myelination begins early in the 3rd trimester, although little myelin exists in the brain at the time of birth. During infancy, myelination occurs quickly, leading to a child’s fast development, including crawling and walking in the first year. Myelination continues through the adolescent stage of life. The nerve cell is made up of a cell body and a long, projecting nerve fibre called the axon that is responsible for the transmission of electrical impulses from the cell body to receiving neurons, glands and muscles. 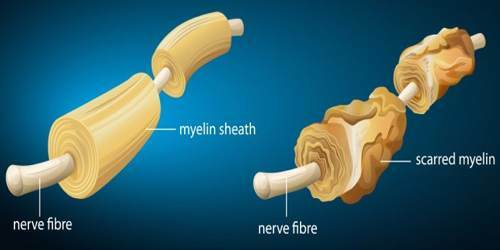 Myelin is considered a defining feature of the vertebrates or animals with a spinal column, although similar sheaths have also evolved in some invertebrates. The myelin sheath of nerve fibres was first discovered and described by Rudolf Virchow in 1854. 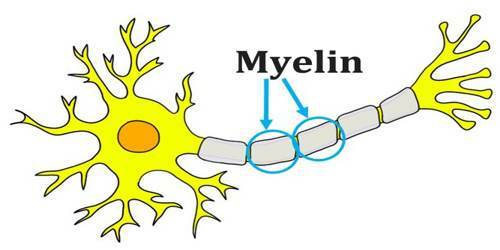 Myelin is made by two different types of support cells. In the central nervous system (CNS) the brain and spinal cord cells called oligodendrocytes wrap their branch-like extensions around axons to create a myelin sheath. 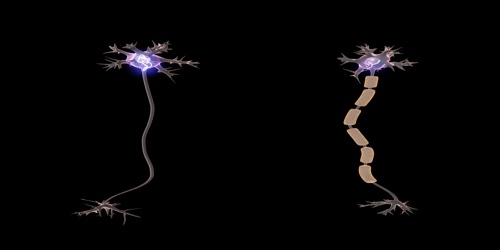 In the nerves outside of the spinal cord, Schwann cells produce myelin. Regardless of where it is in the nervous system, all myelin performs the same function, enabling efficient transmission of electrical signals. Myelin is composed of about 40% water and the dry mass is composed of about 80% lipids and 20% protein. The mainly lipid composition of the myelin gives it a white hue, hence the reference to the brain’s “white matter.” The main lipid found in myelin is a glycolipid called galactocerebroside. Other major myelin constituents include myelin basic protein (MBP), proteolipid protein (PLP) and myelin oligodendrocyte glycoprotein (MOG). Within the myelin, there are cross linked hydrocarbon chains composed of sphingomyelin which strengthens the myelin sheath. The main purpose of a myelin sheath is to increase the speed at which impulses propagate along the myelinated fiber. Along unmyelinated fibers, impulses continuously move as waves, but, in myelinated fibers, they “hop” or propagate by saltatory conduction. Myelin decreases capacitance and increases electrical resistance across the cell membrane (the axolemma). In the 1930s and 1940s, scientists found that this passage of ions helps maintain the electrical signal, allowing it to travel quickly down an axon. The signal appears to “jump” from one node to the next in a process called saltatory conduction. Loss of myelin is a problem for many CNS disorders, including stroke, spinal cord injury, and, most notably, multiple sclerosis (MS). MS is a chronic, disabling disease of the CNS that affects more than 2.3 million people worldwide. MS results from the accumulation of damage to myelin and the underlying nerve fibers it insulates and protects. The majority of patients (about 80%) develop relapse-remitting MS, where neurological symptoms occur in episodes, with no deterioration seen between those episodes. Around 10 years after initial onset of the condition, about half of these patients go on to develop progressive neurological deterioration, referred to as secondary progressive MS. The remaining 20% of MS patients experience a continuous neurological deterioration with no periods where symptoms seem to improve. This is referred to as primary progressive MS.